Mission critical technologies such as TETRA are excellent voice communication networks and the devices used on the network are strong resilient and reliable. Many countries rely on these systems for their police, emergency service and military use. These networks, although reliable, have become outdated when it comes to information rich communication that we are used to with our smart phones. This means that your average teenager in a developed country can receive pictures and videos instantly on their mobile phone, input and receive information rich data from their social media and generally be in close communication. This type of communication is changing the world, allowing revolutionaries to communicate and co-ordinate their activities in a sophisticated way. In comparison the voice handset like a TETRA terminal is a very restricted tool. A simple example is sending information about a missing child or wanted person to a police officer. To describe the person over a voice communication on TETRA would give the police officer information at best an indicative description of the individual they are looking for. SDS over TETRA or other text messaging may send a rudimentary picture and key statistics of identifying features which is better but far from perfect. Whereas on a mobile phone you can get detailed pictures or even a video and if the sought after person has a mobile device on them, the officer can be sent their live location on a map. Access to CCTV could also be given for the identified location and can be used to see if the person may be dangerous to the officer. In short, to keep pace with the man on the street, the police need 4g mobile phones but to use in a secure way. Many now do, and for those that do not, they often carry their personal phone and look up information on that. DABAT handset and hex mount. This is neither good nor secure in the same way as TETRA is and by using public networks then the guarantee to get capacity to communicate is difficult to implement. 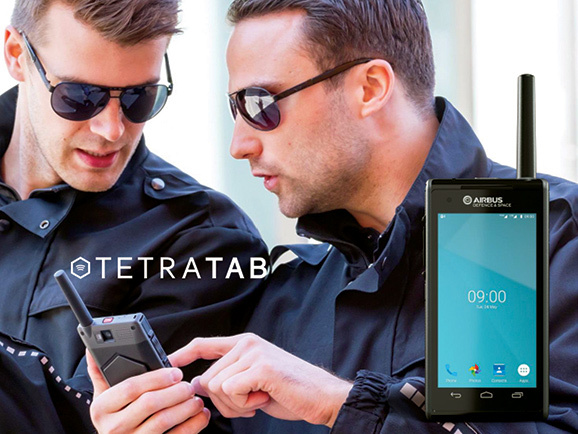 The Airbus Dabat product, represented in the UK by TETRATAB, is a dual bearer device which in one handset combines a 4G LTE smart phone and a TETRA radio. 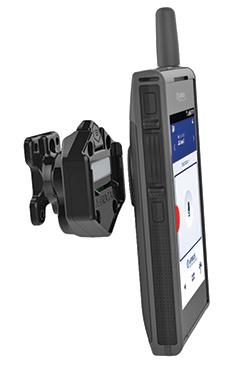 The device has the key features of a TETRA device such as Push to Talk button, Man Down button, programmable buttons and vehicle and clothing mounts. It has a very good audio profile as you would expect from a smart device and a bright controllable screen. A device like this replaces your TETRA handset and your mobile phone and can function off the public safety bands of the LTE networks giving you dedicated coverage when the commercial networks are saturated. Devices like these can tie into your existing TETRA groups and even mobile phone users via a sophisticated application suite called Tactillon. Any Android mobile phone device can become an LTE push to talk device using the Agnet application and then the TETRA, LTE and Hybrid products can be co-ordinated on the Agnet back office system giving 1 PTT to all devices. Hybrid devices are planned to be deployed in many ways. The classic route is to keep the voice and DMO communications TETRA and use the LTE part of the device as a data communicator. In the UK the main communication network is planned to be LTE from 2018 onwards, this make the DABAT is a key transition device. 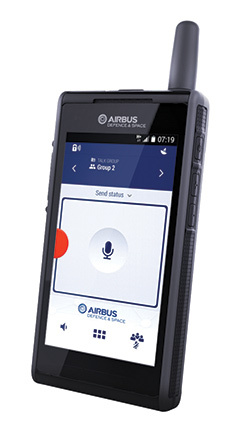 The DABAT allows the user to start on TETRA and be trained on how to use the product on public LTE. As the network transitions, the device can be switched to public safety LTE and as users go into areas where there is no LTE coverage then they can revert to TETRA network communication or even TETRA DMO. Applications suitable for mission critical use are now becoming available making such devices a user rich experience. Location based mapping can now be linked to live video. Information from IOT devices can alert users to dangers such as fire or smoke. The hybrid devices are the ideal platform to develop secure and information rich communications and applications.